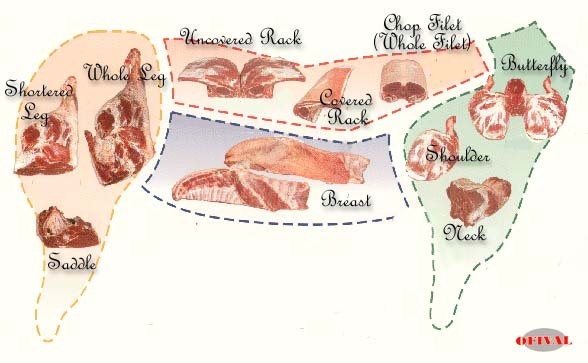 - Thanks to its tender and tasty meat, the lamb has always had the reputation of being a refined food. It has a predominant place in the grande cuisine, but also in the daily cooking. There is nothing comparable with a leg or baron of a Farm Lamb of Quercy to delight your guests, or a tender lamb chop to please your children. - For a long time in our country, the lamb has been the symbol of springtime. At the same time you find the paschal lamb on the market you will find also tender young vegetables, herbs and garlic on the stem which goes perfectly with it. - The farm lamb of Quercy is used in cooking throughout the world and the recipes being created here and there are a real invitation to travel for the gastronome. In India the Tandoori or the Curry, in Greece the Moussaka, in North Africa the Mechoui or the Shish-kebab.